your lifestyle. Our name was inspired by the secret in your eyes, coming from the Spanish 'ojos' (eyes). There is truly a story behind everyone's eyes, and we take pride in creating beautiful eyewear that not only protects, but showcases the mystery of your eyes. 'The best doesn't always mean the most expensive - everyone has their own preference! harm lenses, today's extra strength soaps are powerful enough to slowly disintegrate lens. ADD TO CART RIGHT NOW! 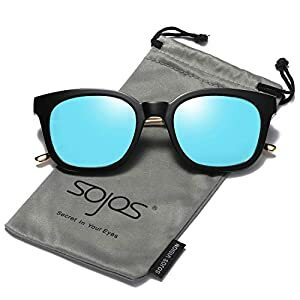 UV400 PROTECTION FOR YOUR EYES - SojoS Vision's anti-reflective sunglasses with HD polarized lenses can filter out sunlight reflected glare, and protect your eyes from long term damage by blocking 100% of harmful UVA and UVB rays. HIGH QUALITY MATERIALS - SojoS Vision sunglasses is made of high quality PC material that is durable enough for long time using. They are suitable for any climate and weather conditions. PERFECT ALL ROUNDER - SojoS Vision sunglasses is the perfect choice for outdoor sports and activities such as shopping, driving, walking, travelling, and is suitable as high fashion accessory and daily wear all year round. It is also gift packaged ready, making it a wonderful yet practical gift idea for friends and family! PRODUCT DIMENSION - Lens Width: 53mm(2.09inches) | Lens height: 44mm(1.73inches) | Temple Length: 150mm(5.91inches) | Nose Bridge: 22mm(0.87inches). 100% MONEY BACK GUARANTEE - SojoS ensures all our customers with 100% Money Back Guarantee and Lifetime Breakage Warranty for our product. In case of any broken issues, please contact us without hesitation. We will provide the best service until our customers are satisfied. You have no risk to try!